The Pittsburgh location submitted closure plans to state regulators while keeping students and faculty in the dark about its future. At least two more Art Institutes still controlled by Dream Center Education Holdings (DCEH) are slated for closure as uncertainty looms over the organization's remaining schools. DCEH unloaded eight Art Institutes in a deal with another nonprofit in January. The organization itself and its remaining colleges went into receivership later in the month. DCEH, which is owned by the faith-based Dream Center Foundation, has faced heavy operating losses and mounting problems with creditors and landlords since buying the Art Institutes from Education Management Corp. (EDMC) a little more than a year ago, shortly before the for-profit filed for bankruptcy. Most of the other Art Institutes in receivership were already scheduled to close and were teaching out their remaining students. 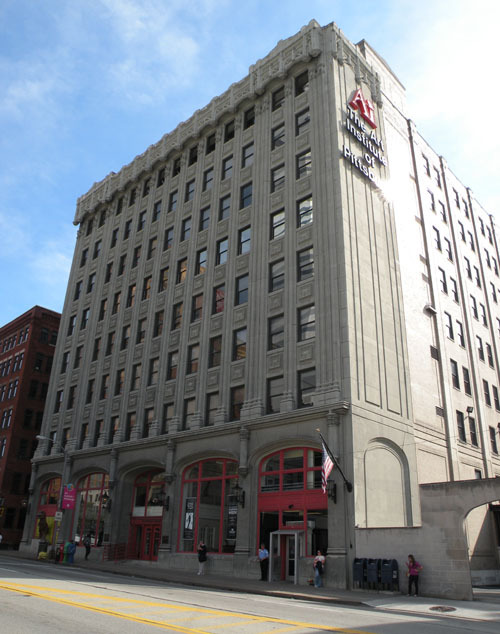 Of the three Art Institutes still operating and enrolling students, two — Las Vegas and Pittsburgh — are expected to close. The closures would wind down all but one of the Art Institutes remaining with DCEH not currently in teach-out mode. As for the remaining school, AI Seattle, it has been barred by its state regulator from enrolling new students after a surety bond expired. DCEH has not publicly announced Pittsburgh's closure yet, leaving students and faculty to learn of it from press reports as school officials stay quiet on the matter. But a notice sent late last month to the school's accreditor, the U.S. Department of Education and Pennsylvania's state higher ed agency (the latter of which provided the notice document to Education Dive), AI Pittsburgh detailed plans to close by March 31. Under the plan, students would have the option to finish their program, if they could do so by March 31. Others would have to transfer to the nearest Art Institute (for Pittsburgh students, the nearest physical location still enrolling students is in Virginia Beach). Students could also apply for student loan discharges or complete their program with a "partner institution. The Art Institute of Pittsburgh is slated to close by March 31, according to a notice sent to its accreditor and regulators. In the latter case, AI Pittsburgh said it "will seek out transfer/articulation agreements" at accredited schools, but did not indicate that any such agreement existed yet. Importantly, the Pittsburgh location, which also houses the chain's online program, said in the plan it was negotiating with the U.S. Education Department to release up to $2 million from a letter of credit the school had provided to the agency to help it operate through March. If it can't access those funds, AI Pittsburgh said "the campus will be compelled to close immediately due to financial exigency." DCEH has so far acknowledged none of this to students or staff, though the school indicated in the notice that it expected to formally announce closure plans by Jan. 25. On Jan. 31, AI Pittsburgh Provost Jennifer Cooper noted the existence of a news report about the school's planned closure but said, "At this point in time, no official announcement of closure or teach-out has been released to the college," according to an email from Cooper obtained by Education Dive. A source employed by AI Pittsburgh told Education Dive Friday, "Students and faculty know nothing." Similarly, an academic support staff member who was laid off last week told the Pittsburg Post Gazette, "I knew some people were getting laid off. I had no idea we were closing. No clue." That has left students scrambling and trying to understand their options. Adding to the chaos on campus, AI Pittsburgh's interim president, Elden Monday, has resigned, according to a message from campus board chairman AJ Braswell circulated to employees via email and obtained by Education Dive. With Monday's departure, the board will take over more direct oversight of the campus, Braswell said. According to his LinkedIn profile, Monday has served as the chain's institutional president and vice chancellor of campus operations on the West Coast, and he previously held executive roles with the Art Institutes' former for-profit owner EDMC as well as at the University of Phoenix. AI Las Vegas is also slated for closure, according to local media reports. Calls by Education Dive to the campus went unanswered, and a DCEH spokesperson did not respond to messages requesting comment. That leaves Seattle, as well as DCEH's Argosy University and two South University properties. Seattle's fate is uncertain, though the state of Washington's higher ed regulator told Education Dive in an email that it "may have recently found a source" to provide a surety bond. The regulator, the Washington Student Achievement Council (WSAC), previously suspended the college's authorization after a surety bond, meant to insure student tuition payments in the event of closures and other crises, expired. "The business entity that acquired eight other AI campuses in other states has expressed interest in also acquiring AI Seattle," WSAC wrote, noting that the new owner would need to secure a surety bond for AI Seattle. According to WSAC, AI Seattle "is in session and teaching students this term." As for Argosy, DCEH has indicated in court papers that it has a potential buyer in Eastern Gateway Community College, a public college in Ohio that is considering using Argosy's facilities to retrain workers laid off by a General Motors plant in the state. On Jan. 19, the college's accreditor, the WASC Senior College and University Commission, ordered Argosy to show cause that it should not lose its accreditation. The action was prompted by Argosy's receivership as well as the college having been placed on Heightened Cash Monitoring 2 by the Ed Department. The accreditor said Argosy could have its accreditation terminated within a year if it can't prove itself viable and would schedule a meeting with university leaders in the coming months. As of late December, DCEH and its subsidiaries owed trade creditors $41 million and were obligated to pay nearly $11 million in rent across 69 properties, DCEH Chairman Randall Barton said in court papers last month. By that time, DCEH universities faced nine evictions, received 15 default notices from landlords and owed $46 million on a loan going back to the purchase of EDMC's college assets, including the Art Institutes, Argosy University and South University. According to Barton, the losses came as a surprise to DCEH after acquiring the EDMC assets. He said "actual revenues fell far short" of EDMC's projections prior to the acquisition. For 2018, EDMC had projected a $30 million surplus, but by the spring DCEH was looking at a $38 million operating loss instead, with projections for the coming years even bleaker. Early last year, four Art Institutes temporarily lost their accreditation while accreditors reviewed the ownership change. DCEH was required to notify students but, according to allegations in a class-action lawsuit filed in Illinois, instead misled them into believing the schools were still accredited. As the organization's finances became a crisis, the Ed Department helped orchestrate a deal to transfer control of nine Art Institutes to a separate nonprofit, Education Principle Foundation (EPF), according to court filings, with many support services coming from the for-profit Studio Enterprise Manager, an affiliate of Colbeck Capital and an educational services provider in the creative fields. Reports have since identified the leadership of EPF, which changed its name from the Colbeck Foundation on Dec. 31, as top executives at Colbeck Capital. This story has been updated to include new information about the Art Institute of Pittsburgh's leadership changes. A previous version of this article misstated when Education Management Corp. filed for bankruptcy relative to its transaction with Dream Center.